Medusa Slots - 5 reel 25 pay line game and three bonus games! Welcome to the world of Greek mythology where beauty and danger are perfectly combined. Nothing encapsulates the world of legends like the story of Medusa whose gaze would turn men to stone. Mobile Bingo Bonuses introduce Medusa Slots from the software legends that are Microgaming, which offers a rollercoaster of fun and a greater chance of winning. Medusa Slots is a 5 reel 25 pay line game with a RTP (return to player) rate of 95%, and incorporates an array of icons from the myth including snakes, warriors turned to stone, Perseus’s shield, Pegasus and of course Medusa herself. With a beautiful background in the theme of temples and an eerie sound track to add to the grandeur, you’ll soon feel you’ve been transported to the evil creature’s hidden lair. 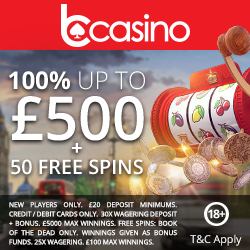 You can bet from as little as 0.01p to 0.20p which makes a total bet of £5 for all enabled pay lines. There’s also an auto play feature where players can customise the game to suit their preferences. When it comes to the wild features, Medusa Slots includes wilds, expanding wilds, spins, re-spins, multipliers, bonus games and a gamble option. The Turned to Stone Re-spin Bonus – This is activated when 3 wild Medusa symbols appear on the reels. You will be awarded 3 re-spins with the possibility of prizes being tripled and reel 2, 3 and 4 can be an expanded wild again boosting wins. The Once Bitten Bonus – The Medusa logo triggers the second bonus where you’ll receive 10 bonus spins, and a double multiplier when 3 or more scatter symbols appear. During this game a special solider symbol can appear on the middle reel, and awards up to 3 super spins dished out. When the spins are over, the accumulated super spins are launched where all spins are multiplied by 5. The Pegasus Bonus – this game is unlocked when 3 scattered Pegasus symbols appear to reveal instant cash prizes. 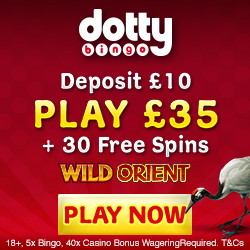 You could win up to 50 times the value of the triggering bet, which is pretty generous. 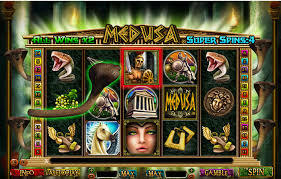 You can play the amazing Medusa Slots on a great online site called Guts Casino. To register and take advantage of the welcome package, simply head to Guts Casino and you’ll find Medusa Slots on their video slots page.